Orange, purple, red and yellow hues erupt from the horizon to reflect on the shore of Cape Hillsborough Beach. Two eastern grey kangaroos are silhouetted along the water’s edge. They hop away into the distance when the sun rises and the light captures the rugged hills plummeting to boulders that meet sandy beaches and the blue sea. Hillsborough National Park is about one hour’s drive north from Mackay and two hours south of Airlie Beach in Queensland. Made famous by kangaroos on the beach at sunrise it is also known for its rugged scenery, walking tracks with spectacular views and native wildlife. The rainforest, eucalypt forest, rocky headlands and beaches make the park an ideal place for campers and bushwalkers. We stay at the Cape Hillsborough Nature Park which is on the beach front, surrounded by the national park and a haven for wildlife. The park offers a variety of accommodation choices from camping and caravanning to beach front huts and a beach house. There are BBQs, toilets, bathrooms, laundry amenities, a swimming pool and a camp kitchen for campers. It has everything you need for a weekend or a few days away, including a small cafe and shop with basic groceries. The accommodation is simple but the location and the kangaroos are what makes the stay here special. 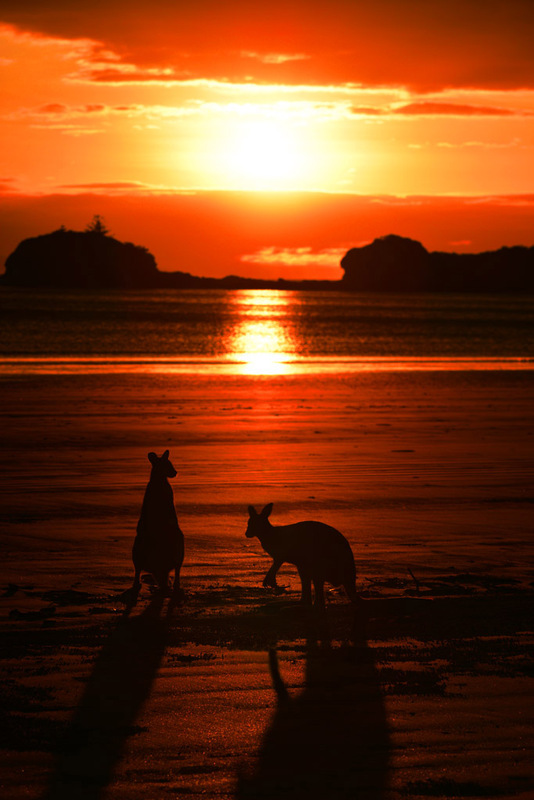 Bridget and Emma Lou, the resident kangaroos are the stars in most of the iconic photos you see of Cape Hillsborough. Unlike the agile wallabies, the eastern grey kangaroos are not naturally found here. The previous owners raised Bridget, Emma Lou and two other female kangaroos from baby orphans. They all went wild except for Bridget and they only returned to the park occasionally to visit her. Unfortunately, dingoes took two of the girls so Emma Lou returned home to Bridget and the nature park. The previous owners could not understand why Bridget never went wild with them. 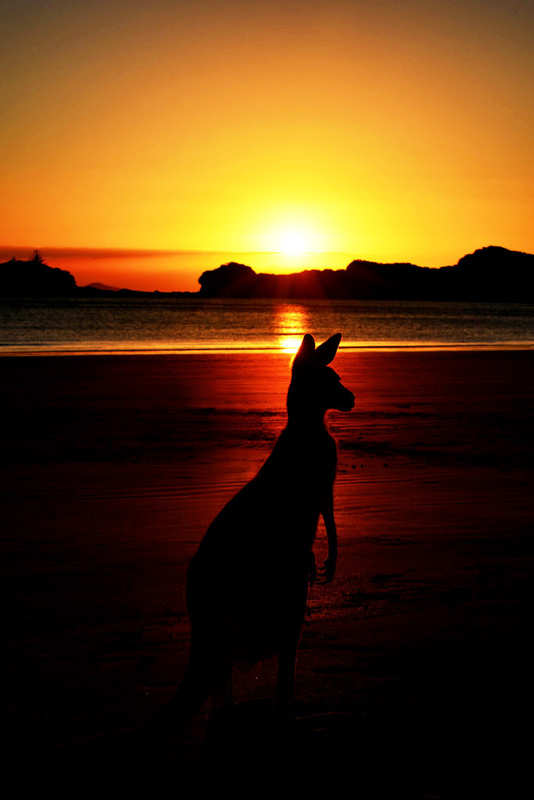 Before sunrise, the kangaroos join the agile wallabies and search and forage on the beach and in the tide. The owners also have permission to supplement their food so the wallabies and kangaroos wait in anticipation for their treats too. When the sun comes over the horizon it is a gorgeous sight with them all together on the beach. It’s a very interactive experience as Bridget and Emma Lou are very sociable and share some close moments with visitors. We can also get close enough to the shyer wallabies and see the cute little babies in their pouches. After they eat they don’t stay on the beach long – about 10-30 minutes before they disappear into the bush. The pretty location, the wildlife, and perfect weather make this a great spot to spend a couple of days relaxing. 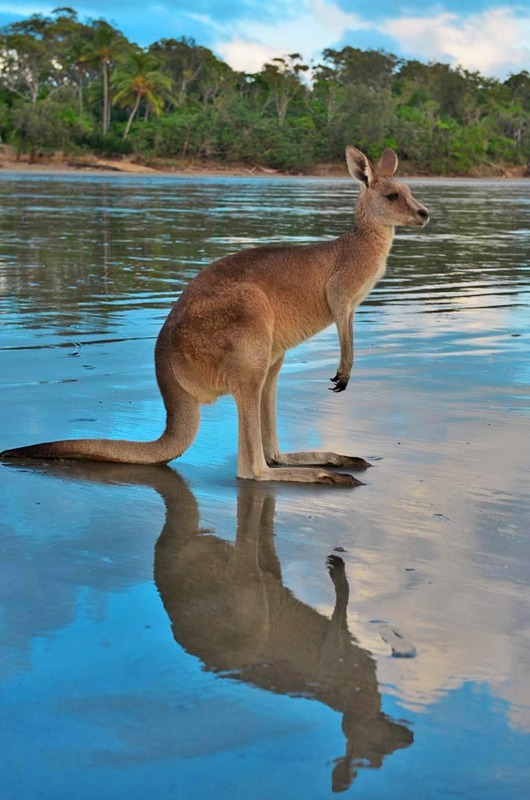 It’s perfect for a stopover during a drive through Queensland or just to see the kangaroos for one morning. Go to the beach before sunrise because the kangaroos and wallabies gather about 30 minutes before and often the predawn light is just as stunning as the sunrise. We didn’t use a tripod to take our images as the kangaroos and wallabies bounce around a lot and it’s so much easier and fun not worrying about a tripod. If you want to see more of Bridget and Emma Lou stay in Hut No. 17 or 23. They often hang out here during the day! There is no wifi signal at Cape Hillsborough. 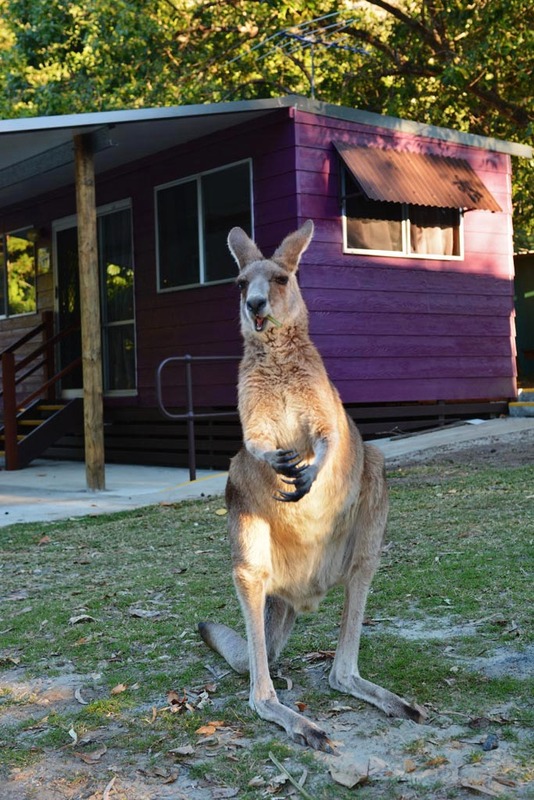 The kangaroos are on the beach all year and the Nature Park can get very busy during school holidays, so book accommodation in advance. 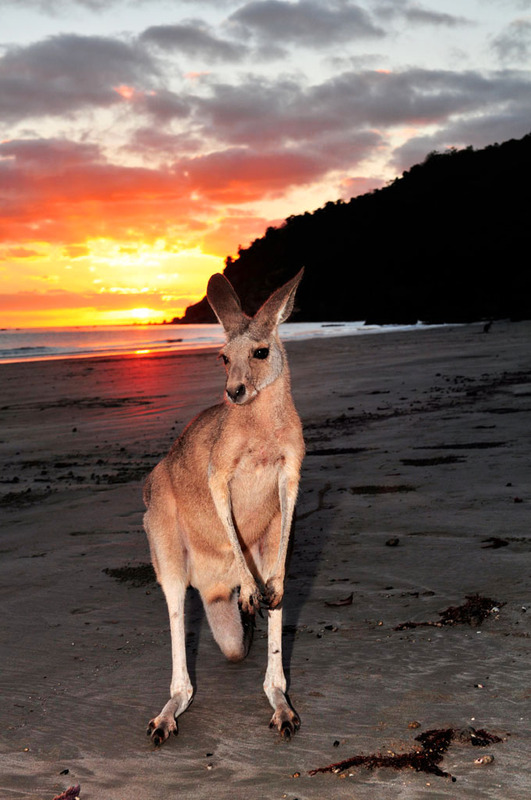 The only time the kangaroos are on the beach is at sunrise. It is not necessary to stay at the park to see the kangaroos on the beach. Park in the car park, walk down to the beach and once on the beach turn right and you will see the kangaroos. Another less expensive option is to pitch your tent at Smalleys Beach and visit the kangaroos at sunrise from here. It is a private little campsite belonging to the National Parks about 5 km away The camp has picnic tables at each site, drinking water and flushing eco-toilets, and some sites have ocean views. It is about $5.75 per person per night. 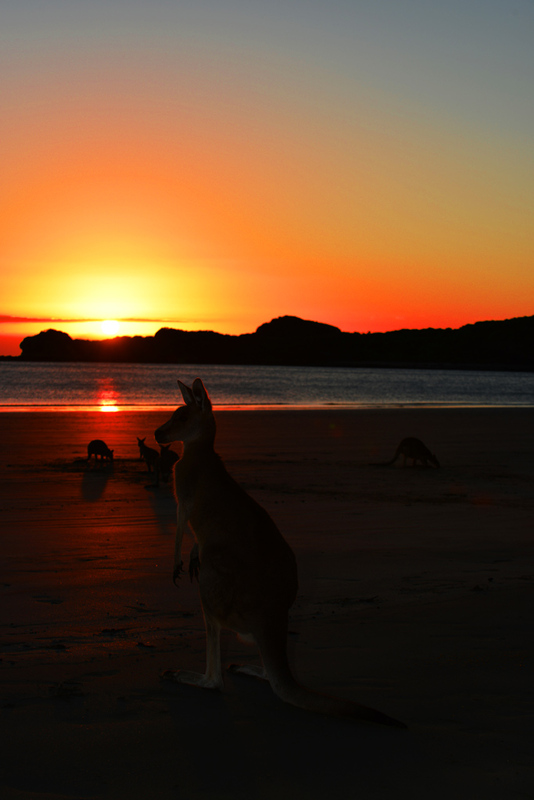 From Smalleys Beach it is only a 5-minute drive to see the kangaroos at sunrise. The Leap Hotel is on the highway about 30 minutes north out of Mackay and just before the turn off to Cape Hillsborough. They offer free overnight camping. 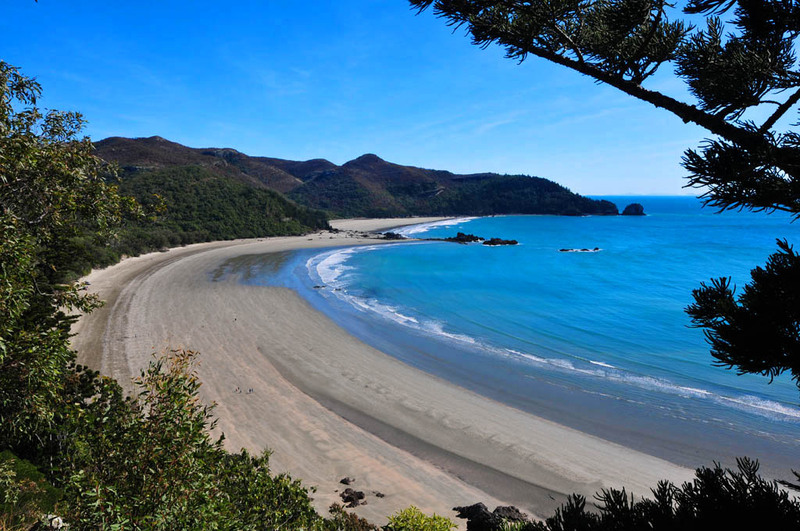 You can pitch your tent here and drive the 30 minutes to Cape Hillsborough in the morning. About 50 metres before the resort there is a little park. We notice some travellers sleep here in their vehicles beside the road the night before they see the kangaroos. However, no camping is allowed in the park itself. From here you can walk down the beach and then turn right to see the kangaroos. It’s well worth spending at least one morning at Cape Hillsborough. Absolutely beautiful photography! Your photos really show how gorgeous our animals really are. Thank you for allowing everyone the priveledge of seeing these. Hi Braeden. Yes we are fortunate to have all these gorgeous animals in Australia. Thanks for visiting our website and commenting! Wow! Such a sunset! And what a beautiful, affordable paradise you have brought to us on a platter. Or should I say ‘plateau’? The trail shot of the bay could rival any beach in the world. Right here on our doorstep and I would never have known it. Now I do and I just have to go there. Your blog is so well done, down to earth, yet you always capture the magical ‘soul’ of a any place you visit. And the animals? well, they look at home in your lens, like they pose on purpose for a friend they know is on their side. Humbling, really. Well done you two. Thank you! Hi Marie. Thanks for your comments. Cape Hillsborough is one of the many beautiful places we have here in Australia. It’s easy to capture the magic when you have great subjects like these! Also thanks for following our travels! Thank you for a great blog on Cape Hillsborough! It has definitely tempted me into visiting the area soon (camping) and am just wondering do you only see the kangaroos before sunrise? do they not come out at dusk as well? Thanks for your comments Vicky. 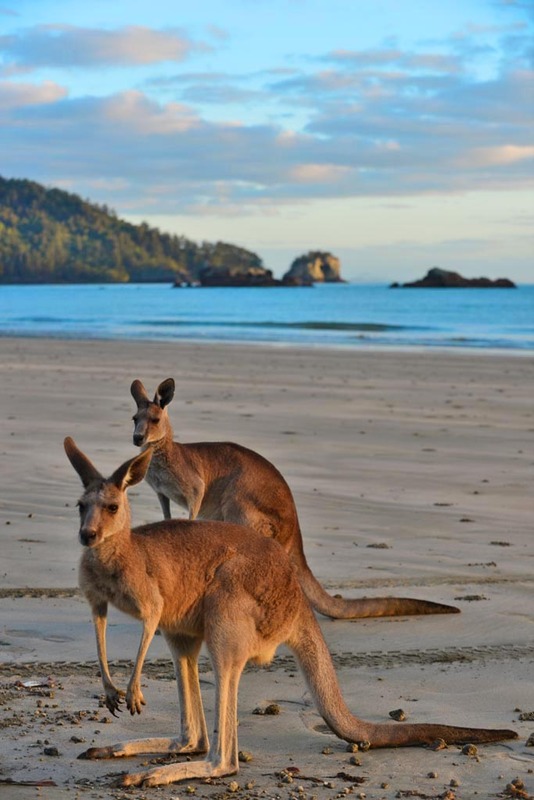 The Kangaroos and Wallabies do tend to be on the beach in the mornings only. During the day Bridget and Emma Lou laze around the park. During our stay we didn’t see them at dusk, as they probably go grazing. You will love the camping at Cape Hillsborough whether you camp at the resort or the Smalleys Beach campground. Remember if you camp at Smalleys Beach you will have to get up a little earlier to make it to see the Kangaroos at sunrise.